The cruel and deadly war of succession has finally come to an end. Those that waged it upon the populace have been driven into exile or thrown in chains. What the world needs now is a time of peace and healing. The capital, Blue Moon City, is in ruins. But the various peoples that live along its rubble-strewn streets are more than ready, willing, and able to put it back together again. Aiding in the efforts are the three great Elemental Dragons. They have returned to give their blessings upon those working to rebuild, and it is their decision as to who will be the next Steward. Who will prove their worth to lead the land into this new age? Blue Moon City is Reiner Knizia’s classic game of city reconstruction. CMON’s new edition includes updated components, art, and rules, as well as streamlined play. In the game, players take on the role of leaders of work parties trying to rebuild the city. There’s far too much work to do for one group, so everyone will have to pitch in. Utilizing the cards from their hand, players move around the city and create teams of workers. The goal is to reconstruct the city’s damaged buildings and gain Crystals for the effort. These precious stones will then be used to make offerings at the central Obelisk. The player who first makes the required number of offerings is the winner and will become leader of Blue Moon City. The game starts off by creating the ruins of the town. The central Obelisk is placed, along with the four starting locations, all with their rubble side faceup. From there, the rest of the city will be laid out, using the other modular tiles. All of them are placed rubble side faceup, eventually forming a city of 21 tiles. Each player picks a miniature and takes it along with all the markers matching their color. Everyone puts their miniature on the Obelisk tile. The People cards are shuffled together and each player is dealt eight cards. From there, the game is ready to begin. During a player’s turn, they move around the city and use the cards in their hand to either restore the various buildings or for the card’s special power. Turns are split up into the Movement phase and the Contribution phase. During the Movement phase, players can move their miniature up to two spaces (no diagonals!) around the city. Then, during the Contribution phase, they will play sets of like-colored cards in order to try and rebuild the part of the city where they’re located. Cards have a contribution power of one, two, or three, determining how much they bring to the rebuilding effort. City tiles have spaces on them indicating how much work needs to be done and what colors are needed. By playing cards equal to or more than the spaces on the tile, players can add one of their colored disks to it, showing that they’ve contributed to the rebuilding efforts. Multiple Contributions can be made during a turn, so if a player has enough of the right cards, they could help out several times, possibly even finishing the tile off. Whenever a City tile’s spaces are all filled with player markers, that section has been successfully rebuilt. The tile is then scored. Each player that contributed to the tile gets a bonus, and the player that contributed the most to the rebuilding efforts get an extra reward. Each tile has different rewards, shown on them. After the rewards have been given, the tile is flipped so that the rebuilt side is faceup. Tiles also have a Neighborhood bonus on them. This is a bonus reward given to each player that contributed to the rebuilding efforts based on completed buildings around the tile that just flipped. So, it’s a good idea to rebuild tiles next to one-another, as there’s extra bonuses involved for doing so. Anytime during a player’s turn, they can use the cards in their hand for the special ability on them. Each color card has a different type of bonuses associated with it, such as the blue cards which allow players to move around the Blue Dragon, or the grey cards letting players move their miniature around the city more effectively, or the green cards which can be used as Wild cards when creating groups of like-colored cards. Each one is different, but all have the rules printed on them, so you know what they do without having to look it up. The goal of rebuilding tiles is getting Crystals. On a player’s turn, if they are at the central Obelisk, they can spend collected Crystals to make contributions to it, just like they would spend cards on City tiles. Spending the right amount lets them place a marker on the Obelisk. The first player to make the right number of contributions (depending on the number of players) is the winner. Blue Moon City is all about set collection and making sure you get the best bonuses for the cards you have in-hand. With the modular nature of the City tiles, no two games will ever be entirely the same, as the bonuses will be spread out differently every time you play. The race is on to prove your worth, with the dragons watching over, ready to crown the next leader. 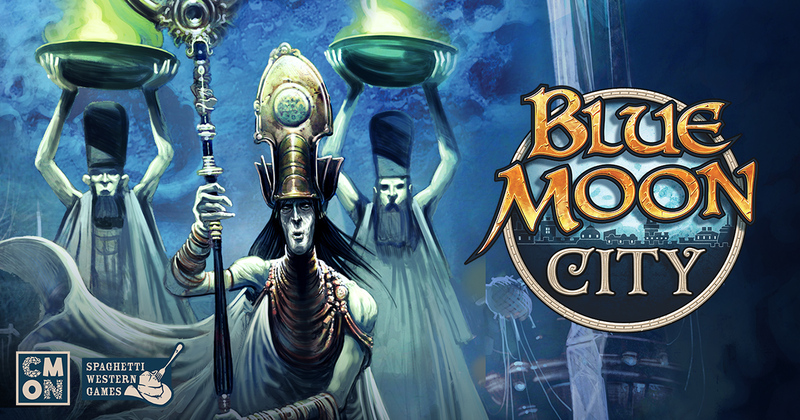 Blue Moon City will be available in your FLGS October 26. You can read more about Blue Moon City here.